photo: ANAITTE. 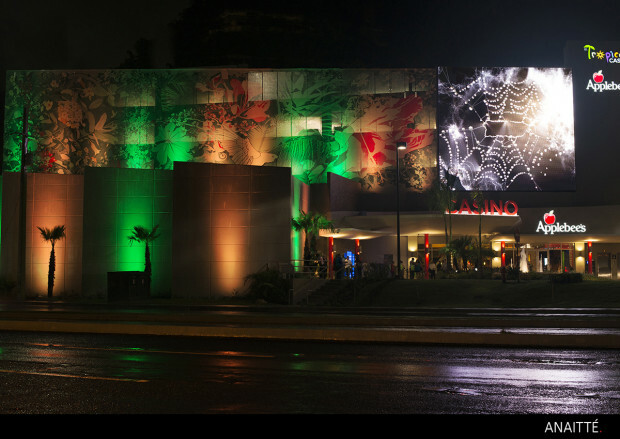 Casino Atlantico. Hyatt Place Bayamon. 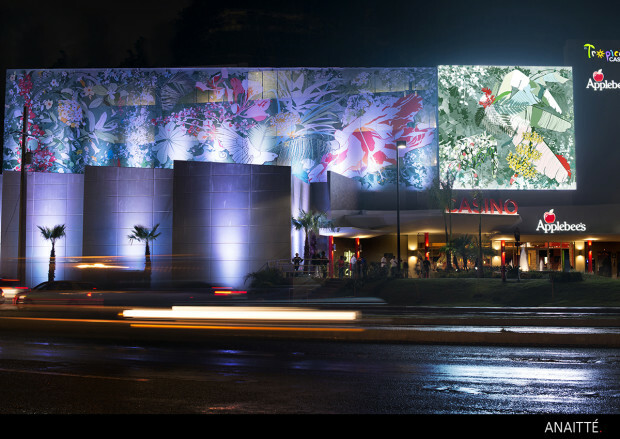 Boscaje Iluminado (Illuminated Landscape) evolves from a "green wall" concept. Inspired by the richness and beauty found in Puerto Rico's lush bio-diversity, it is a Puerto Rican landscape, one that lives during the day and transforms at night. 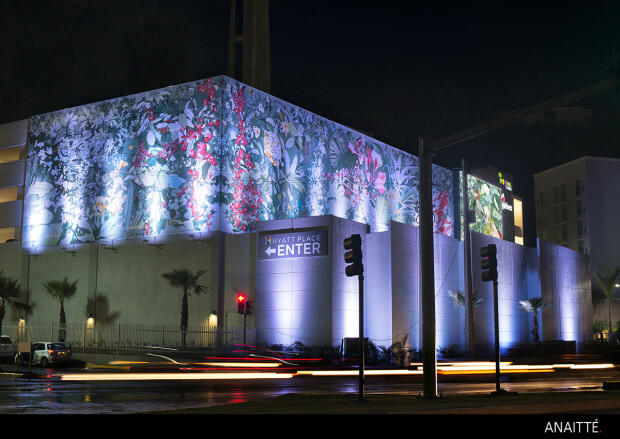 The artwork that wraps around the building is a "Green Wall" comprised of indigenous flora that compose iconic symbols of our culture. At night the whole building illuminates, reminiscent of the bioluminescent phenomenon found throughout the island. At the turn of every hour, the lights engage in a synchronized dance to animation and music...enhancing the structure to waltz the night away. PRISA Group, has focused on resort and residential development for over three decades and is highly regarded for its enhancement of natural landscapes and the integration of art in communities. When the time came to develop their first multi-level parking structure in a highly visible city environment, they sought to create something different; something that would also reflect the dynamism of the place as the city's most vibrant entertainment destination. They commissioned ANAITTÉ. to create a "green wall on canvas" that would marry their appreciation and respect for the natural environment with their love of art and design as a form of expression and beauty. In addition, they wanted the piece to generate excitement for the destination as a vibrant urban center. 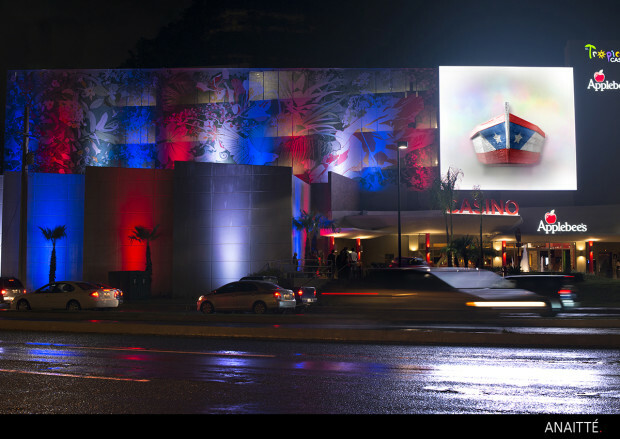 The result, is a multi-sensory experience that sets a new standard in Puerto Rico of how art, landscapes and multi-media can be integrated into a Project's aesthetic to create a distinct sense of place. 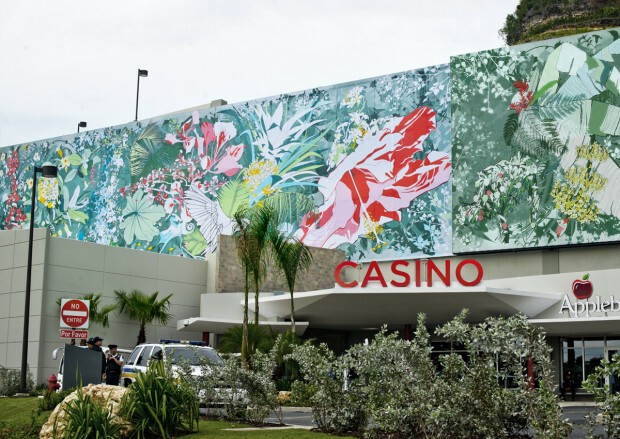 The collaboration process was between the artist - ANAITTÉ., the client and developer - Prisa Group, and the audio visual company installing the equipment. This process can be better explained by simplifying it into phases. First Phase: Brainstorming. After grasping the overall concept of what the client wanted to do, and working within a given budget, various sketches, mock-ups, and animatics were provided to the client for their feedback. Second Phase: Practicality. Once there was a favorite design selected, modifications were incorporated in order to comply with engineering and technical requirements. Third Phase: Install. With the final design approved, we needed to coordinate the logistics of installation. An efficient schedule was produced to have the piece installed, working, and programmed by the hotel's inauguration date.